The Savannah City Market has been selling fresh seafood, fruits and vegetables, and an assortment of merchandise since 1755. It is a delightful place to explore, whether you are looking for last minute Christmas gifts, shopping for ingredients to make dinner at your luxury Savannah Vacation Rental, or simply grabbing a bite for lunch. Finish your holiday shopping at Savannah City Market, where shops feature everything from barrels of candy to original works of art. Find items “Georgia Made and Georgia Grown” at All Things Georgia, and exotic fossils and minerals from all over the world at Nature’s Treasures. Unique handmade jewelry and stylish designer silk jackets are available at Silver Silk and Beads, and fun fashion accessories line the shelves at Twinkle. When hunger strikes, you’ll find some of the finest restaurants in Savannah here. Try the Cajun Lobster Ravioli at Bedford’s Savannah, or hot wings and a cold beer at Wild Wing Cafe. Tapas By Anna features tried and true family recipes from Italy, and a wide assortment of tapas; and you can’t go wrong with Anna’s She-crab soup. The Cafe at City Market is an elegant European-style bistro with inspired specials of the day. If you want to dine at your Vacation Rental Savannah after a day out and about at the City Market, order a thin-crusted pizza from Vinnie Van Go-Go’s; it will be delivered by bicycle to your door. You’ll find the perfect bottle of Southern wine to accompany that pie at Meinhardt Winery, and cigars to enjoy after the meal at Savannah Cigars. 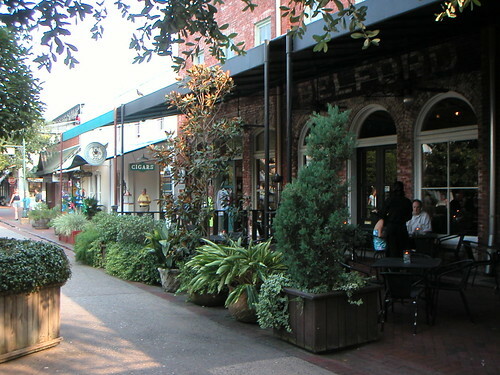 The Savannah City Market is close to all three of our luxury Savannah Vacation Rentals.